Try this for a vegetarian lasagne that somehow tastes ‘meaty’. Not only this but there’s no white sauce to make and plenty of leftover eggplant sauce to use for another meal. For a very long time I’ve been searching for a tasty vegetarian lasagne. Without meaning to be too negative… it’s been tough! Most of the versions I’ve tried have fallen into the category of ‘OK’. Not necessarily horrible, but nothing very special. 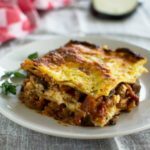 Please point me in the direction of any good veggie lasagne recipes you’ve found! 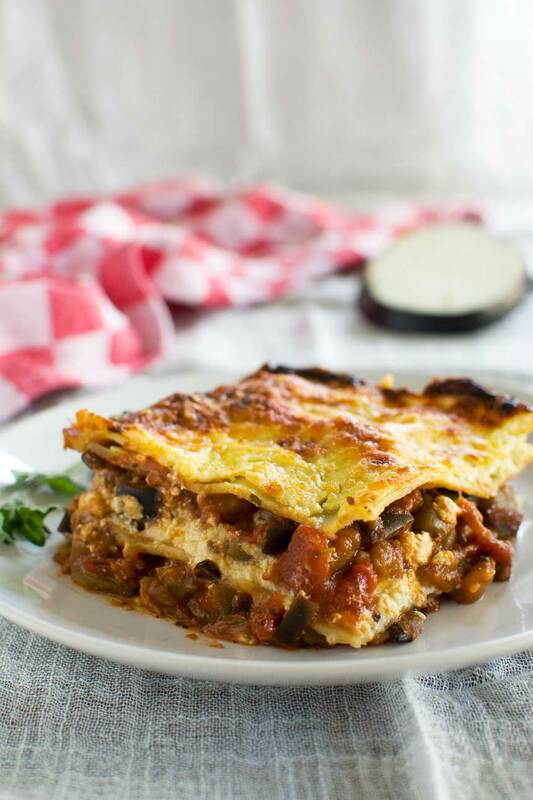 If you’re a meat lover, I can’t promise that you’ll LOVE this lasagne alla norma (aka eggplant lasagne! ), but you MIGHT. Just give it a chance. Mr. Scrummy has been loving his rare steaks since we arrived in Australia (yuck), but he still really enjoys this lasagne. Without any prompting from me, he said it tasted really ‘meaty’. I’ve heard eggplant called ‘meaty’ before, but I have to say I agree with Mr. Scrummy on this one. Somehow this lasagne does taste quite meaty. 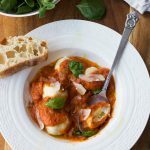 There aren’t just a few bits of eggplant floating around in a bland tomato sauce. It’s packed full of it. 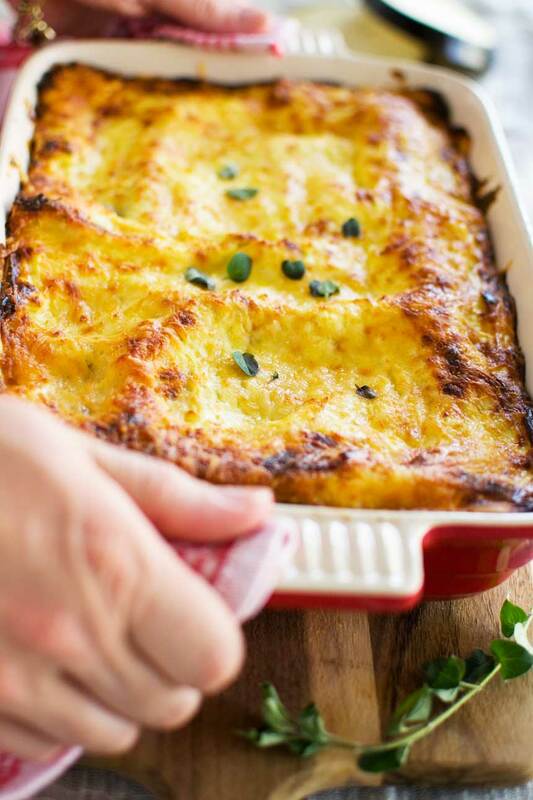 And the best part – you don’t have to make a white sauce for this lasagne. White sauce in lasagne is good, but don’t you find it a bit tiresome to make? Instead of a traditional white sauce, I used ricotta cheese mixed with an egg and parmesan cheese. 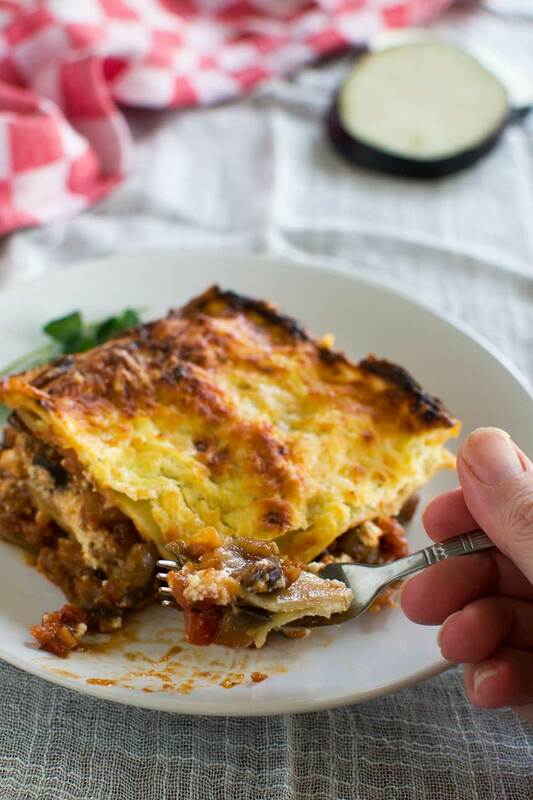 You end up with a moist and tasty lasagne – no need for white sauce. lasagne, consider giving this one a try. What was that about 2-meals-in-1? Well, I find there’s quite a lot of sauce left over after assembling the lasagne. You could use it to make an extra smaller lasagne for the freezer, or I like to freeze it and use it later as a simple pasta sauce. If there’s only 2 of you, you’ll have dinner for 3 nights. The lasagne serves 4 and heats up really well the next day in the microwave. A few days later, you can use the spare sauce to make pasta alla norma. That delicious vegetarian lasagne you've always been looking for. You don't need to make any white sauce, and you won't believe it hasn't got meat in it. Heat up the olive oil in a large skillet/frying pan, then cook the eggplant cubes for 10 minutes, stirring regularly. Add the garlic and chili flakes and cook and stir for another minute or two. 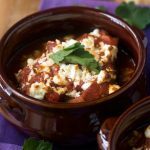 Add the tomatoes, sugar, balsamic vinegar and herbs and simmer for 15 minutes or until the eggplant is tender. Meanwhile, beat the egg and 1 cup of parmesan into the ricotta cheese. Grind in some black pepper (to taste). Cover the bottom of a 9 x 6 inch (or equivalent) baking dish with a really thin layer of the eggplant mixture (just to stop the lasagne sticking). 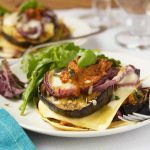 Top with lasagne sheets, then spread a good layer of eggplant sauce over them. Top with half the ricotta mixture. Sprinkle with a bit of extra parmesan cheese. Bake at 355F/180C for 30 minutes or until bubbling around the edges and starting to brown on top. *I actually only used 13 ounces / 375 grams ricotta cheese as this is how much was in the tub. I feel 400 grams is a better amount, but don't sweat it if you have slightly less! **You can make the dish up to 2 days ahead to this stage. Simply cover and store in the fridge until you’re ready to bake. Or wrap well and freeze at this stage. Either cook from frozen, adding about fifteen minutes to the cooking time, or defrost and cook as normal. Cover with aluminium foil if the top starts to brown too much. On the other hand, if you’d like the top to be a bit browner at the end of the cooking time, just grill(UK)/broil(US) for a few minutes. I often do this! You have several options for the leftover eggplant sauce. 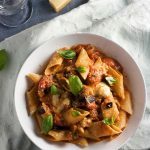 Either make another smaller lasagne for the freezer (probably with just 2 eggplant layers this time), make pasta alla norma with it, or use it as a nutritious pizza sauce… mmm! Thank you, will give this a go, it sounds tasty. This recipe looks sooooo good. I’m going to sprinkle some nutmeg into the ricotta mixture…can’t wait!!! Hi Deb! I know you won’t be disappointed. I wanted to keep my recipe list as short as possible, but it did cross my mind to add nutmeg to the ricotta. Go for it! This dish looks fantastic! Great combination. Can’t wait to try it! Ooops, sorry Janette. You’ll just have to go and make some! This sounds SO good Helen! Yes some vegetarian lasagnas can be really uninspiring can’t they? Please do, Marissa. I think it’ll be right up your Italian alley!